IN SEATTLE’S love-it-or-hate it building boom, even the color of the construction cranes is a matter of perspective. For most of us, they’re ominous yellow flags, signifying change, progress or disruption. But for anyone wearing a hard hat and toiling beneath one, they’re pure gold. Nothing new there. In a city defined by boom/bust cycles, the up and downsides of such “progress” have been the subject of booze-fueled banter in local imbiberies since Filson was selling clothes to miners, not hipsters. More than a century later, that bar tab is still open. Mostly lost in arguments over this seam-bursting is one undeniable human upside: Beneath all those hard hats are real, mostly local, people, quietly enjoying unprecedented job security. If you can get him on the phone, just ask Monty Anderson, head of the Seattle Building & Construction Trades Council. Not just that day. In an industry known for its feast-or-famine uncertainty, the Seattle- area construction calendar is booked as far as the eye can see. 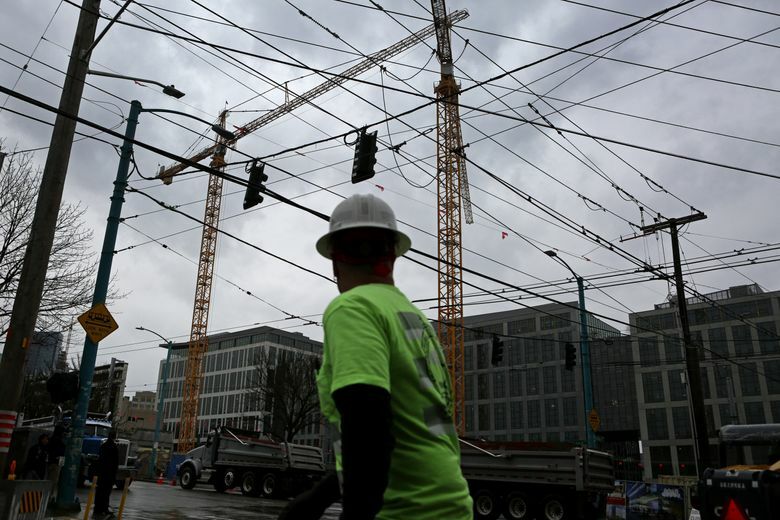 The construction boom hasn’t peaked, labor officials say — it’s just picking up momentum. While the downtown/South Lake Union apartment boom that pulled the industry out of the Great Recession is ebbing, a succeeding boom in office space is already taking its place. Following in line is a list of relatively recession-proof megaprojects: A massive expansion of the downtown Washington State Convention Center. The ongoing Elliott Bay seawall and Highway 99 tunnel projects. Sound Transit light-rail lines. Major construction at the Port of Seattle. 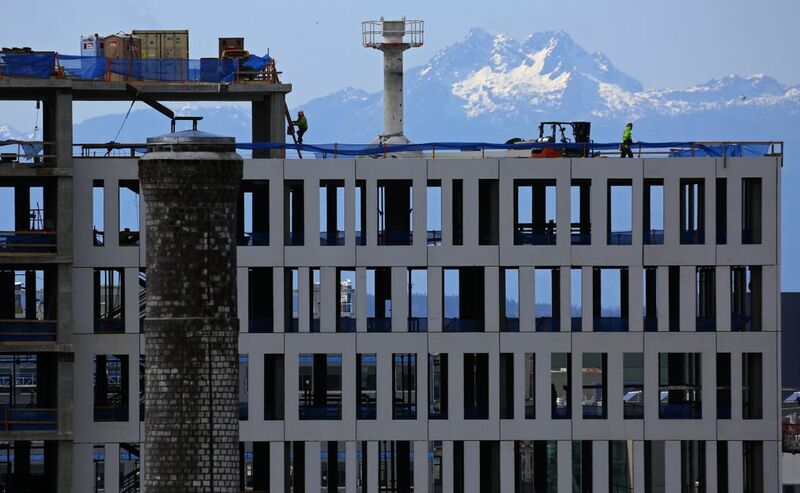 The build-out is not confined to city limits: Thousands of construction workers have been working at Naval Base Kitsap on Hood Canal, Puget Sound oil refineries, Boeing’s new 777X wing facilities in Everett, and office space in Bellevue. Even windmills in Central Washington provide jobs for local ironworkers. The list goes on — as much as $25 billion in regional construction over the next decade. 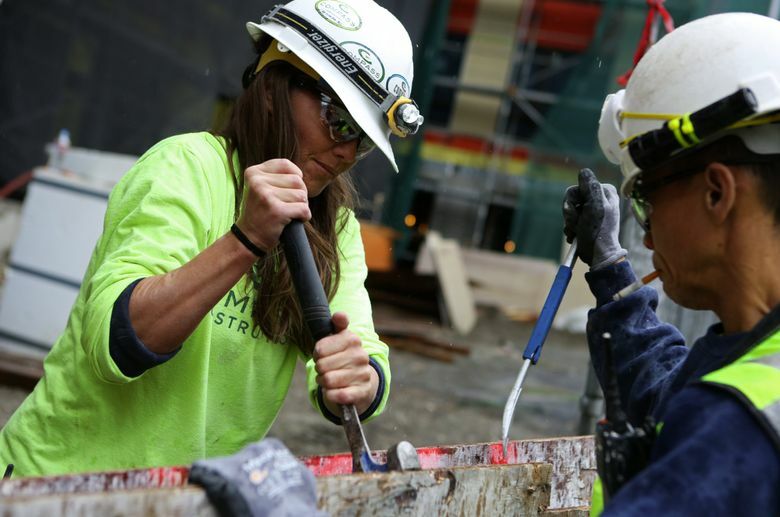 The statewide roster of about 75,000 union building-trades workers is expected to grow by 5,000 or more in the next 18 months. And the boom is significant beyond the short-term paydays, labor officials say: It’s paving the way for a younger, more-diverse, better-trained heavy construction workforce. SO WHO is digging all those foundations, pumping all that concrete and slinging all that steel? Union workers, mostly. About three-fourths of workers on publicly financed projects and about two-thirds on all projects are union labor. Specialists in large-scale construction, they’re distinct from construction workers in the homebuilding/contracting industries, which have been slower to recover from recession slumps. While some “boomers” with specific, in-demand skills, such as welding, have been drawn here, only a fraction of the workforce has been imported, North Dakota-fracking style. Most workers have been here all along, not working or otherwise engaged. Sheer numbers of local building-trades workers peaked around 2007, when a wave of city condo projects made them among the busiest in America. Much of that work vanished during the financial meltdown the following year. As many as 60 percent of local plumbers, electricians and sheet-metal workers sat idle. When Seattle’s new boom began anew two years ago, experienced, journey-level workers who had left the business got the first calls. Some came back, but others had moved on. They’re finding many of them right here — by design, through programs both within unions and by their employers that aim to keep solid construction salaries at home. Terrell Woods, 26, worked smaller-scale local construction since graduating from Roosevelt High School. 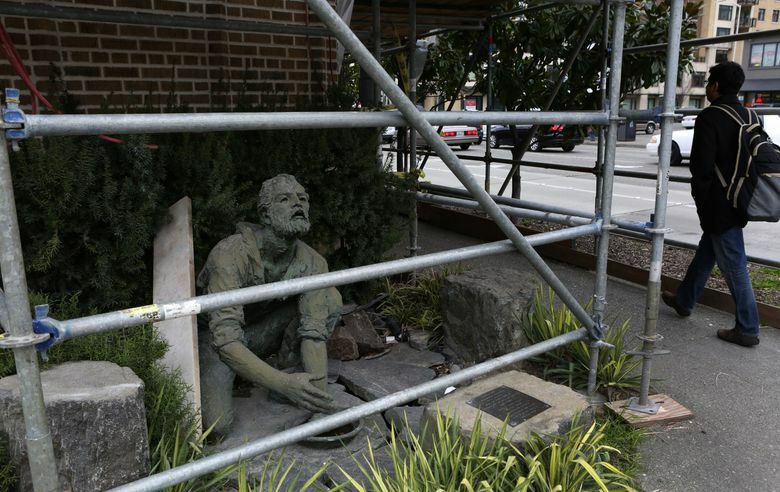 When the ironworkers put out the welcome mat, he saw it as a step to his trade’s big leagues. Woods, who like many has worked and trained simultaneously through a four-year apprenticeship, will become a journey-level worker in November — a major step on a career path that pays newcomers $20 an hour, plus full benefits, progressing to more than $60 an hour for journeymen. On the cusp of journeyman status in the country’s hottest labor market, Woods, for the first time, sees a future that will allow him to follow in the steps of generations of American ironworkers who have seen the world by assembling its infrastructure. 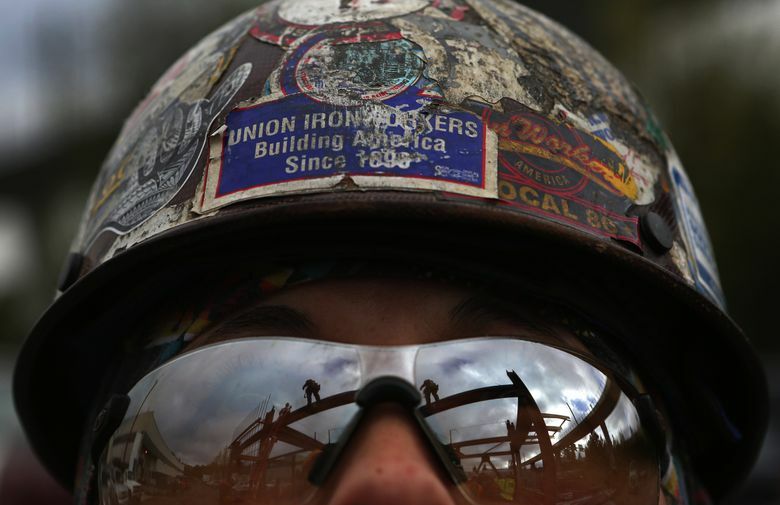 THE UNION that snared Woods, Ironworkers Local 86, is headquartered in Tukwila, where office walls are adorned by fading, classic photographs of men straddling girders atop some of the highest structures in the world. 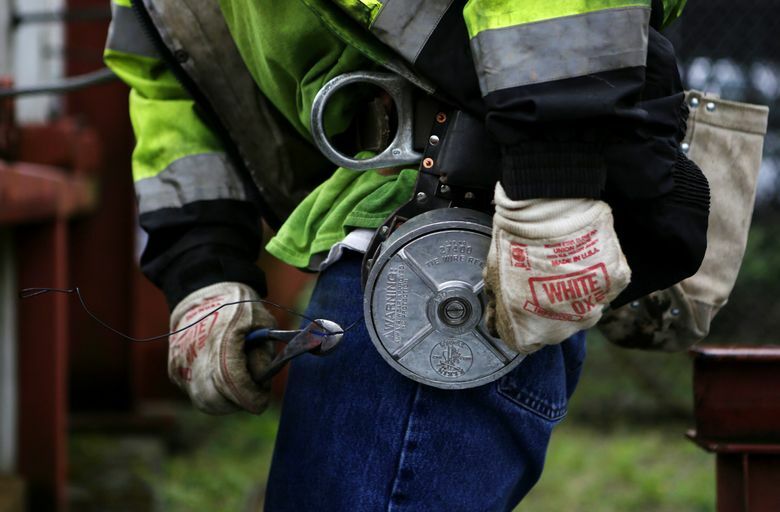 A handful of those old-school guys ultimately fell to their deaths in an inherently hazardous occupation, notes Jeff Glockner, a 33-year ironworker veteran and the local’s business manager. The work is just as tough, but a lot safer now. 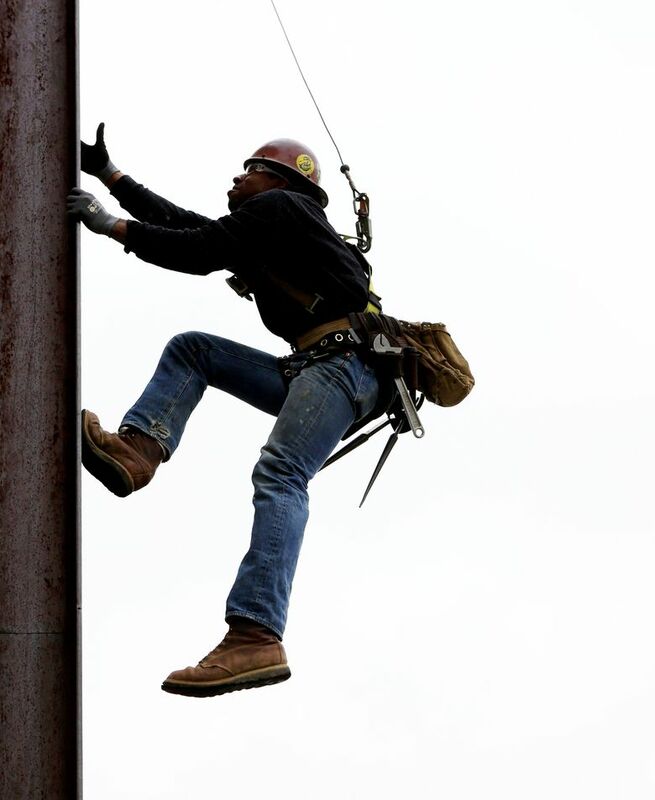 Requirements that workers have at least one safety tether connecting their heavy harnesses to a structure at all times have slashed fatal injuries. The union has become similarly philosophical about other stubborn past beliefs. Like many others, Local 86 has tried to hang onto qualities that keep its workers the best-paid, and most in-demand, in the industry, Glockner says. The most significant selling point is the skill and sturdy professionalism of its people — fostered through intentionally cultivated competitiveness among the ranks. Construction craft jobs tend to run between generations. Ironworkers remain part of the clan even after they hang up their harnesses. The union is rife with stories about members helping out family members of those who go down on the job. 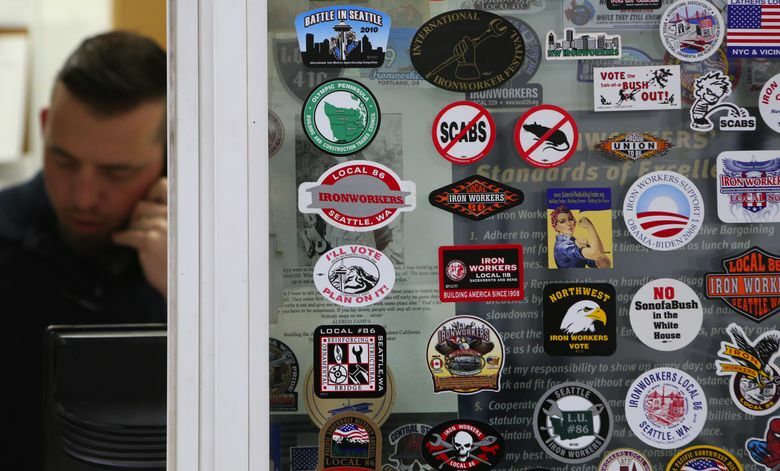 But the union, Glockner says, is just as passionate about leaving some of the old traditions in the history books — such as a combative stance with employers and a system that funneled most work to a good ol’ boys club. Union construction workers, many of whom have trained and worked together for years, say they also function better as a team, getting work done better and faster with fewer bodies. This helps maintain the level of work, Newgent says, that employers expect when they dish out $60 an hour for work they could get from “open shop,” or nonunion workers, for substantially less. THE PUSH for diversity and local hiring, not coincidentally, fits tidily with goals espoused by some of these workers’ best long-term customers — public entities such as the city of Seattle. 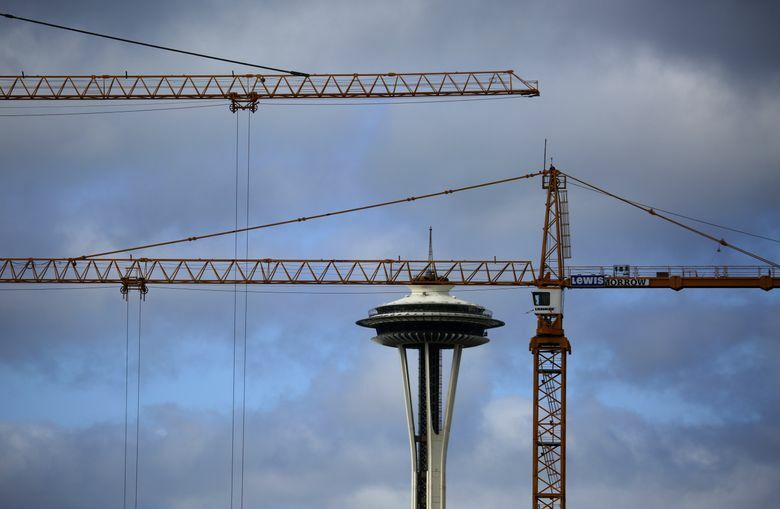 After a study showed that only 6 percent of workers on 33 city projects between 2009 and 2013 were Seattle residents, Mayor Ed Murray recently pitched the City Council a solution: A “Project Labor Agreement” (PLA) plan, approved earlier this year. The goal is to avoid labor disputes while “insourcing” the highest number of jobs possible to workers of color, women, veterans and residents of poorer neighborhoods. 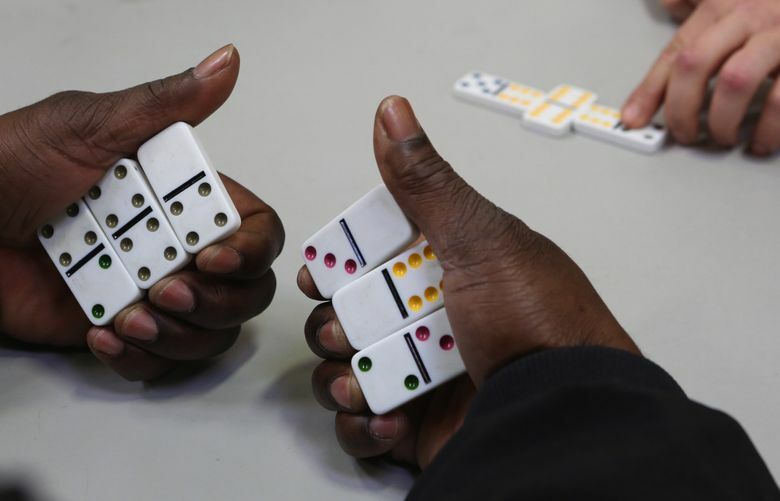 The pact essentially moves the task of developing more-diverse workforces out of the hands of public bodies — where affirmative-action programs have been ruled illegal — and shifts it to labor unions, which are increasingly receptive. 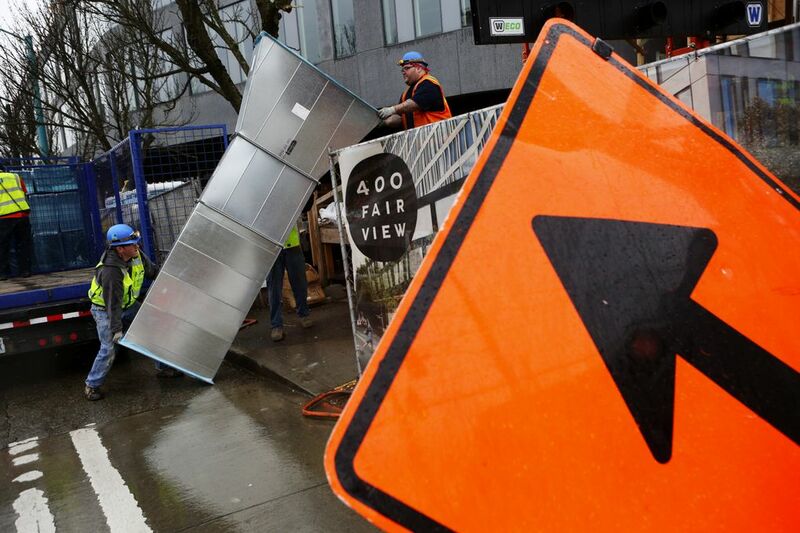 Under Seattle’s new Priority-Hire Agreement, public projects of $5 million or more require contractors to offer at least 20 percent of all construction hours to workers from disadvantaged ZIP codes. Contractors also are required to reserve 15 percent of work for apprentice workers, and are urged to recruit women and people of color into accelerated apprenticeship programs. Apprenticeship enrollment is expected to double in coming years. The ironworkers alone have added nearly 300 apprentices the past 18 months — some recruited through programs such as a training school at the state women’s prison in Purdy. While the diversity provisions aren’t binding for private projects, Newgent says there’s a carry-over effect: The 15-percent apprentice guideline, for example, has held “pretty consistent” on private jobs, he says. 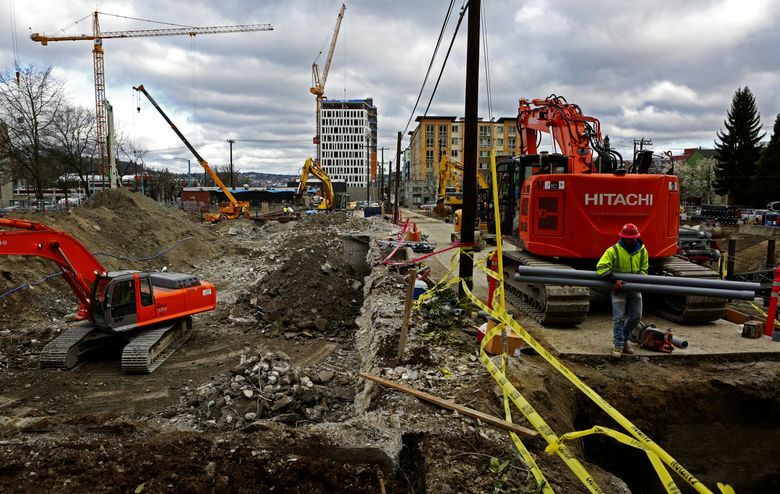 The PLA concept, also adopted by Sound Transit and the Port of Seattle and being negotiated elsewhere, is hotly opposed by critics who say the agreements are unfair to nonunion contractors and increase overall construction costs. (National studies on PLAs have come to mixed conclusions on cost and general impact.) In Seattle, some minority small-contracting firms complained that the pact creates mountains of paperwork and freezes them out of jobs. City and union officials dispute that, arguing that the agreements, in the end, benefit the local economy and might even save money on some longterm projects. 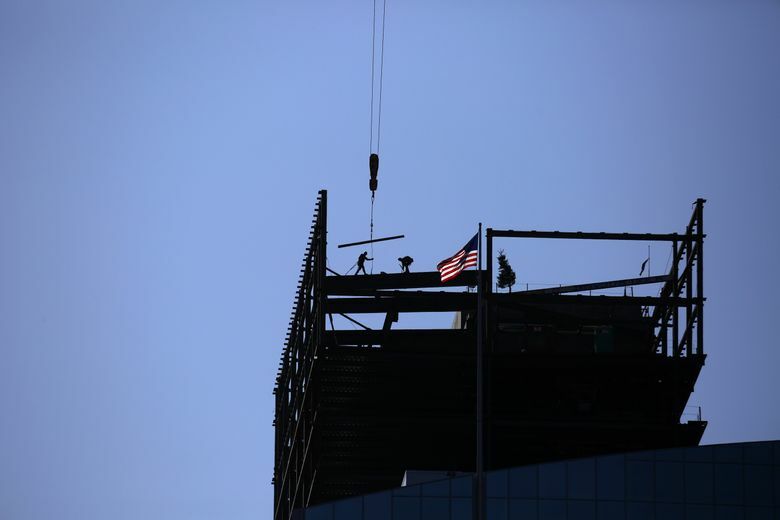 AT DOWNTOWN job sites today, work is done in eight- or 10-hour shifts, up to six days a week. The frenetic pace isn’t unusual: Every moment a construction crane stands, it’s costing the builder a fortune. Working in busy urban cores (“a mess,” Newgent says, “but a mess we grew up with”) presents challenges, such as parking — or the looks that come with schlepping 50 pounds of tools onto a cheek-to-cheek Metro bus. 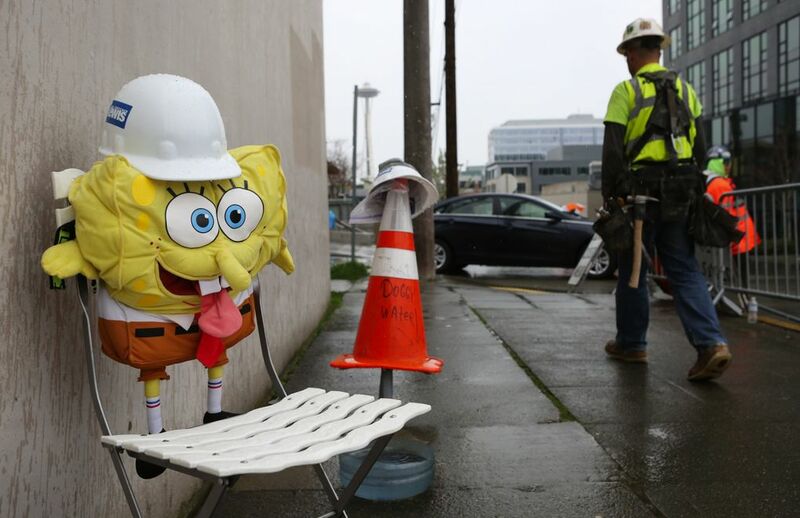 In South Lake Union, the convergence of hard hats and young techies has created a cultural riptide. “I make a perfectly good living doing what I’m doing,” Christiansen says. And the ability to do it with a future that appears secure has been a revelation to younger workers. The building boom is more than a payday for apprentice Carlos Baldoz, 32, of Carnation, who worked lower-paying, smaller construction jobs before being swept into Local 86’s training program last summer. It’s family stability for him, his girlfriend and their three boys, aged 3 to 7. As a kid, Baldoz hopscotched between communities as his father sought work. Memories of that disruption drive him to keep slinging steel and bolting girders beneath that forest of yellow cranes, assembling buildings Baldoz takes pride in knowing will long outlast him and his co-workers. To him and his peers, there’s only one side to the building boom. And that’s up. Ron Judd: rjudd@seattletimes.com or 206-464-8280. On Twitter @roncjudd. Ken Lambert is a Seattle Times staff photographer.